Having trouble finding good candidates? Over the age of 60? We work as a team. Unlike our competitors, our team setup means that we are more concerned with placing you in the right job than being placed with a particular recruiter. You may end up working with three different recruiters on three different job openings. All of our account executives and recruiters have at least 4-year engineering degrees and at least five years of engineering industry experience. This ensures the highest level of competence and professionalism in the staffing industry, delivering the best possible service to both our clients and our candidates. Our account executives / recruiters average more than 10 years of experience with us. This means you’ll be working with a knowledgeable industry professional, not someone who’s just being trained. 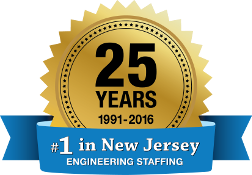 Call us today and speak with our management or one of our recruiters at (973) 490-7000. To email one of us, click on a photo below. To connect on LinkedIn, click to the right of a photo.